Learning and development professionals are expected to deliver training that meets the ever-changing demands of the industry. An organization might have a repository of training content and legacy learning courses that are still relevant today. But is its modern workforce ready to go through this content? Let’s consider two different scenarios to answer this question. Scenario A: Learners in an organization are asked to go through an online training that is 2 hours long. They click through the slides, just because they are required to complete the training. This doesn’t add any value to them, even though the content covered in the training is highly-relevant to them. Scenario B: There’s something that’s changed about online training in the organization. Lengthy training is replaced by shorter learning modules. Also, learners are no longer expected to complete the course glued to their seats. So, if they decide to complete module one at their desk, they can continue with module 2 on their way home, accessing the training program on their smartphones. Once home, they can just switch to an iPad to complete the next module and so on. Which scenario would learners love? Undoubtedly it is scenario B, for the flexibility and device-independent learning it offers. 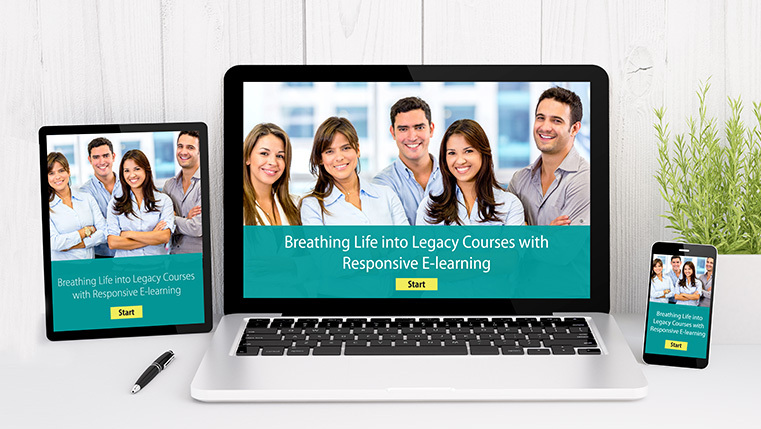 For organizations that are currently facing a situation similar to scenario A, it’s time to give legacy courses a new lease of life through responsive learning. Read on to know how we helped our clients with legacy course conversions. Each of them had different reasons to opt for legacy course conversion and also made use of different authoring tools. Our client, a Fortune 500 telecommunications conglomerate based in the US wanted its repository of over 500 legacy courses to be converted to mobile-device compatible courses. The repository of legacy courses that our client had, were developed in an older version of Lectora Inspire. The courses were aimed at training sales and service technicians on the company’s processes, policies, and products. The organization wanted to provide learners the flexibility to access the training programs at their convenience on the mobile devices of their choice. Access to Lectora Online was quick and convenient, since this is a cloud-based authoring tool. There were multiple reviewers involved in the course, both on the client side as well as from our end. Lectora Online made it easier for multiple reviewers to access the course and give their feedback. It was also easier to keep track of the feedback. We didn’t have to worry about data backups as everything was stored on the cloud, and backed up on a safe, secure server. For this particular project, the client provided us with the source files of the legacy courses and fully functional wireframes, which shortened the development time to a great extent. This project is a perfect example of rapid e-learning development – in just 8 weeks we had over 500 courses ready for rollout. A US-based global leader in water treatment processes wanted us to convert their existing 3-hour course into an interactive e-learning curriculum. The client had a page-turner course that was developed in an older version of Adobe Captivate. Interactive responsive courses were the need of the hour because they wanted to use these courses to deliver impactful training to customer care executives, service technicians, and also their external partners’ employees. Using Articulate Storyline, the lengthy legacy course was converted to an interactive e-learning curriculum that contained 16 modules. Here’s why we chose Storyline for this project. The legacy course had to be converted to multiple courses that contained level 3 interactivities. Level 3 interactivities meant including graphics, animations, illustrations, games, and quizzes, and Articulate Storyline is a tool that’s perfect for adding such interactivities in a course. Designing mobile-compatible courses was quick and easy as compared to using other authoring tools. The courses had to be translated into other international languages, and Storyline offers excellent support for multilingual e-learning course development. We even gave learners an option to pick their preferred language in the main interface of the course. We leveraged the skills of our instructional designers as well as translation experts in this project, as a lengthy course had to be broken down into 16 courses that were high on interactivity, and also translated into different languages. Canada’s largest catering services and restaurant chain wanted us to convert their legacy courses because they had invested in a new authoring tool. The client had 10 online courses developed using Articulate Storyline. They wanted their in-house team to be able to make updates to training content, and had invested in dominKnow Claro, a cloud-based authoring tool. The easy learning curve enabled the client’s in-house team to make subsequent updates to online courses. Advanced review and collaboration features meant that multiple people could work on an online course simultaneously, and it could also be reviewed by multiple reviewers. Letting go of useful learning resources just because they are not mobile-compatible, can prove to be a wasted expense. Instead, opting for legacy course conversion is a safe bet. With an L&D landscape that’s undergoing constant transformation, there’s an increasing need to convert the legacy courses in your organization to interesting, responsive e-learning courses. Are you ready to get started?